Imagine flipping a coin three times. What's the probability you will get a head on at least one of the flips? He put a tick by all the outcomes that included at least one head. How could Charlie use his tree diagram to work out the probability of getting at least one head? How could he use it to work out the probability of getting no heads? What do you notice about these two probabilities? Devise a quick way of working out the probability of getting at least one head when you flip a coin 4, 5, 6... times. What is the probability of getting at least one head when you flip a coin ten times? Imagine choosing a ball from this bag and then replacing it. 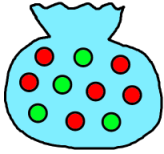 If you did this three times, what's the probability that you would pick at least one green ball? What if you didn't replace the ball each time? Imagine a class with 15 girls and 13 boys. What is the probability that there will be at least one boy? Why not try the problem Same Number! next? Equally likely outcomes. Interactivities. Probability. Experimental probability. Combining probabilities. Theoretical probability. Curious. 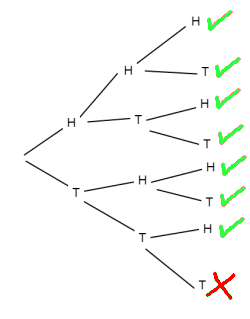 Tree diagrams. Resourceful. Conditional probability.